Witch-hazel is a deciduous shrub or small tree for all seasons. In spring it bursts forth in a new robe of greenery, while in summer its thick, distinctively scalloped leaves with a matte finish form a dense cloak of dark green in the woodland understory. Autumn is when it shines. The leaves turn a rich buttery color, and last year’s popping pods loudly announce its presence, as the spidery, lemon-yellow flowers burst forth on the suddenly leafless branchlets. Even in winter it’s a standout with its zig-zag, naked twigs, bearing the squat, light brown, two-beaked capsules, both old and new. Since the days of the early settlers, who confused it with the real hazel of Europe that was long thought to have special divining powers, true believers have used the flexible withes of witch-hazel as divining rods to dowse or “witch” for water. This seems the most likely of several competing explanations for the common name. The generic name, Hamamelis, dating to antiquity, was coined from two Greek words, meaning “fruit” and “together with” or “at the same time.” This alludes to the shrub’s unique feature of producing this year’s flowers even as last year’s capsules are ripening on the branchlets and dispersing their seeds. In the Northeast, witch-hazel is the last native woody plant of the season to flower, spreading its blooms in September, October, or November. Some blooms may open as late as February in the Washington, DC, area in mild winters. Witch-hazel is especially appropriate as a Wildflower of the Year because it was first discovered in Virginia, hence its specific scientific name, virginiana. A slow-growing, short-lived shrub or small tree, 25-30 ft. high, with several trunks from a short main trunk, witch-hazel is commonly a large shrub less than 10 ft. high with slender twigs and a broad, rounded crown. It reaches its greatest size in the Appalachian Mountains of the Carolinas, where it may ascend to an elevation of 4,000 ft. It may be clonal, spreading from underground rootstocks. The thin, light brown bark is slightly scaly. The simple, alternate leaves are broadly oval, 3-6 in. long, irregularly scalloped along the margin, and quite asymmetrical at the base. The naked buds lack scales to protect the embryonic leaves. The leaves are host to a number of distinctive insect galls, notably one that is shaped like a witch’s hat. 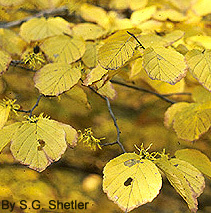 Its maker spends part of its life cycle on birch, often a witch-hazel associate. The naked buds lack scales to protect the beginnings of next year’s leaves. The small but showy yellow flowers, borne in clusters of three in the leaf axils, consist of a 4-parted calyx, 4 petals, 8 stamens, and 2 pistils united at the base and forming a single, 2-chambered and 2-beaked capsule. The strap-like petals are up to an inch long. The flowers are insect-pollinated. The half-inch capsule takes a year to mature, turning from green to brown and becoming woody. It splits open at the top and explosively ejects the shiny black seeds (usually 2) up to 30 ft. away. This forcible ejection makes audible “snap, crackle, and pop” sounds that can spook one who is walking alone in the woods on a sunny fall day. Hedges of witch-hazel have been used as a windbreak for wildlife, but few birds actually eat the seeds. The American Indians dried the leaves for a tea and were first to use a decoction of the leaves and bark as a liniment for muscular aches and bruises. “Witch Hazel,” the liniment long made from an extract of the leaves and/or twigs and bark, depending on where it is made, is still on the market. Witch-hazel grows in small numbers in the understory of dry or moist, typically oak-hickory woodlands, especially in deep soil, or along forest edges and often beside streams. It is widespread in eastern North America from southeastern Canada to central Florida and west to Minnesota and Texas. It is indigenous to nearly all counties of Virginia (see distribution in the Atlas of the Virginia Flora, III, 1992) and is easiest to identify in the fall.. The main threat to this still relatively common native species is habitat destruction. Gardeners should not collect witch-hazel in the wild and should be certain that all native plants purchased for home gardens are nursery-propagated, not wild-collected.